WordPress just expanded their stats page… the page now provides all time stats. I looked at the all time post count for the posts in this blog and noticed something interesting. 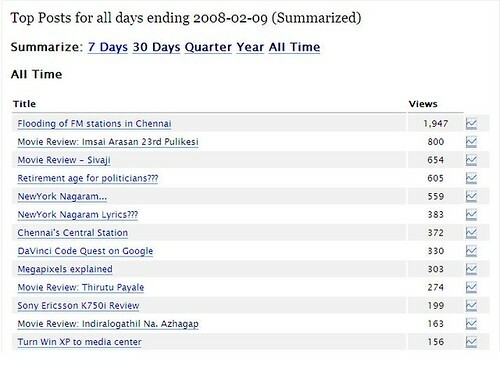 The top post is something on FM stations in Chennai. I thought so, since this is the post that receives maximum number of spam comments. The second spot was rather surprising… Review of Imsai Arasan movie. The movie itself was average/bad, but can’t believe that the post got so many hits. Review of Indiralogathil… already has so many hits within a week of the post. I am repeating again… Whatever it is, please don’t watch the movie. This entry was posted on February 9, 2008 at 1:48 pm	and is filed under Miscellaneous. Tagged: stats statistics. You can follow any responses to this entry through the RSS 2.0 feed. You can leave a response, or trackback from your own site.